Houston Weight Loss Center now specializes in CoolSculpting. Click below to learn more. SculpSure is a revolutionary fat reduction treatment that is non-surgical, non-invasive, does not require any downtime, and provides proven lasting results*. 10.1 Who is a candidate for SculpSure? 10.2 How long does a SculpSure treatment take? 10.4 When will I see my results? 10.5 Will my results last? SculpSure has received over 90% patients satisfaction rate and is continually rising because of its speed, comfortability, and efficiency*. Cynosure’s SculpSure is the world’s first FDA approved non-surgical, non-invasive laser solution for fat reduction. SculpSure heats fat cells with infrared lasers to initiate lipolysis, or death of fat cells. It’s specially designed flat applicator lays on the skin of the treatment area, and while heat is emanating, cold temperature cools the skin to keep patients comfortable during their treatment. Infrared light from the SculpSure device is emitted from a hyperthermic laser that penetrates the the skin to effectively reach fat cells. The 1064nm wavelength is able to pass through the epidermis and dermis without harming the skin and heats the fat cells to a temperature of around 110 degrees Fahrenheit. This can be equated to how light passing through a car window does not damage the window, but heats the inside of the car. After around a month post treatment, the treatment area becomes filled with a cell naturally found in the body called macrophage*. Macrophage can be seen as performing “cleanup duty,” engulfing dead cells and small particles in the body, and in turn naturally removing the destroyed fat cells*. Adults fat cells cannot regenerate, so this treatment provides lasting results*. From the treatment, collagen is also produced by fibroblasts and aids the skin to tighten and form to its new contour*. Sculpsure has been approved by the FDA for treatment of the flanks and abdomen. However, it’s specially designed applicator is flexible enough for treatment of other areas of the body like the thighs, back, arms, and buttocks. A consultation examination with one of our body contouring experts is necessary to assess your candidacy. Our fat cell count becomes steady as we come to our teenage years. From then on, gaining weight does not increase the amount of fat cells, but rather their size. One reason people gain weight is from eating more food/fat than is needed by the body for energy. When an excess amount of food/fat is consumed, the body processes the fat that it requires for an energy source, and the remaining fat is stored in fat cells. So the more excess fat that is not processed for energy, the larger fat cells can become. When you lose weight from eating a healthy diet or exercising, fat cells do not disappear, they shrink. So when you lose weight, the shrunken fat cells have the potential to enlarge again. With SculpSure, fat cells are removed from your body*. There is no chance for these cells to regenerate in the treatment area. It is important to maintain a healthy lifestyle though to make sure surrounding fat cells that were not treated do not enlarge. Fat reduction treatments such as SculpSure by Cynosure are the only way to lose fat, rather than just lose weight*. You will have an initial consultation at Houston Weight Loss Center where you will discuss your aesthetic concerns and desires. You will then undergo an examination in order for our SculpSure consultant to assess if SculpSure is the right treatment for you. If deemed a candidate, they will also be able to determine the proper applicator frame shape and the amount of applicators that you will require. No two treatments are alike; both you and your SculpSure consultant will come up with a customized treatment plan that will give you optimal results*. We are experts at SculpSure and will do everything in our power to give you the results you desire. Your treatment session starts with our taking photos of the treatment area and then marking the exact areas the SculpSure expert will treat. They will choose an applicator pattern that will best fit the contour of the area(s) you are having treated. Applicators are secured in place in a patterned plastic frame which is held in place with elastic straps. The amount of applicators necessary for your treatment area will be determined during your initial consultation. They will then turn on the device which will begin to emit infrared wavelengths while it simultaneously cools your skin. Feeling the warm/cold intervals signifies that the wavelengths are directly targeting the designated fat cells. The flatness of the applicator makes for even results, and the curved edges of the applicator reaches surrounding tissue to naturally blend results*. Your treatment will be completed in less than half an hour, and you can return to your normal daily routine right away*. The time it takes to see your results varies depending on your body and it’s natural removal process, but typically you can begin to see your results in about 4 – 6 weeks*. This is the average time it takes for the macrophage cells to begin removing the fat cells that were destroyed during your SculpSure treatment*. Your results can continue to improve for up to 11 – 12 weeks after your treatment*. And the results you see are the results you can enjoy for a long time as long as you eat well, exercise regularly, and maintain a stable weight*. Up to 4 applicators can be used for each 25 minute SculpSure treatment. Our competitive price for each applicator is $350*. The average abdomen can be treated with 4 applicators, and that can be done in a single 25 minute session*. The average flanks/love handles can also be treated with 4 applicators (2 on each side). This treatment would also last 25 minutes*. Multiple areas can be treated the same day. Discounts apply when more than 8 applicators are used. At the time of your complimentary consultation, your SculpSure consultant will determine the number of applicators need to effectively treat the areas. 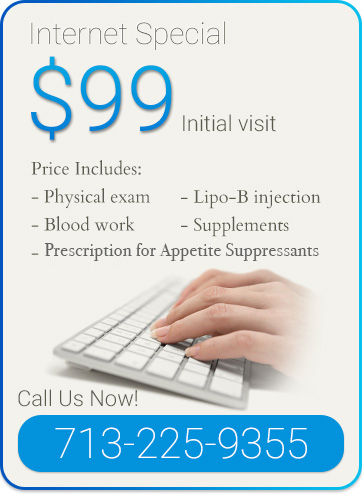 There is never charge for a consultation at Houston Weight Loss Center. All SculpSure candidates will meet one-on-one with a body sculpting consultant to access appropriateness for the procedure. Category 1: Patients who can “pinch an inch.” These men and women have small localized pockets of fat that, no matter how much time they spend in the gym, does not diminish. Category 2: Patients who can pinch more than an inch. These men and women could be candidates for liposuction, but do not wish to undergo an invasive surgical procedure. Category 2 patients generally require more than one treatment to reach their aesthetic goal*. A SculpSure treatment takes 25 minutes or less*. Treating multiple areas may increase treatment length. Most patients experience minimal to no pain*. The integrated cooling while heating keeps patients at a comfortable temperature. People have reported that they feel slight tingling, but this is not painful*. Results are visible in about a month (around the time the macrophage cells remove the destroyed fat cells)*. Results will continue to improve for up to 3 months*. Yes*! On the condition that patients continue to exercise regularly and eat a proper diet. But because the cells that are destroyed cannot regenerate, so long as you keep the surrounding areas slim your results should be long-lasting*.